Kimchi is fermented napa cabbage and is considered to be Korea’s national dish. Raw cabbage is cured in salt to kill off the bacteria before being preserved in a flavoured liquor. It is believed that the creation of Kimchi was a result of the long cold winters in Korea where farming of fresh crops was impossible. Kimchi is similar to sauerkraut, another pickled cabbage dish originating in Germany. Gochugaru is a type of Korean red chilli flakes. Transfer the kimchi into a sterilised airtight container and leave to ferment at room temperature. You will need to release the air a couple of times during the fermentation process which should take up to a week. 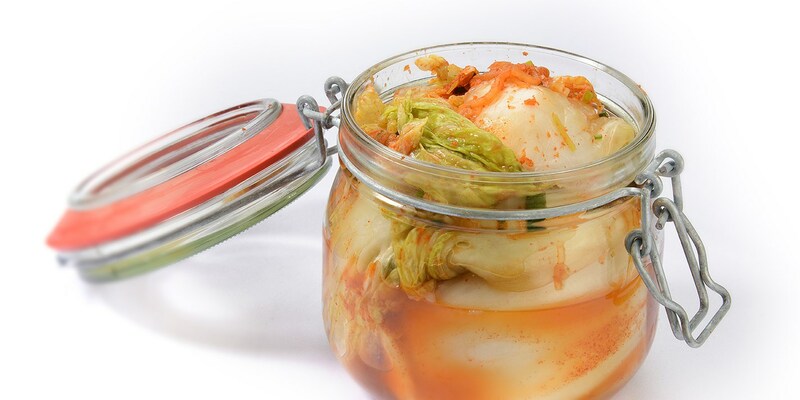 Once the kimchi has fully fermented, store in the fridge for a maximum of 2 months. Kimchi is past its best when the cabbage loses its crunch. Kimchi has a chilli kick which is nicely balanced by the fermented sour and salty flavours. As the fermentation process is continual, the flavour will change over time and develop. Kimchi is often enjoyed with barbecued foods such as hot dogs or pulled pork, served in grilled cheese sandwiches, tossed in soups, stews, scrambled eggs or fried rice.